There is nothing worse than getting a new BBQ tool that doesn't live up to your expectations. Rather than being a helpful tool, it just ends up collecting dust in the cabinet. In order to help you avoid that, I've to put together this BBQ Shopping Guide with 8 BBQ products that I trust. I have either personally used each tool I recommend, or they come to me highly recommend by friends. Most of these tools are under $20, so they won't break the bank either. For full disclosure, all of the links in this article are Amazon affiliate links. It won't change the cost of any of the products, but I get a small percentage of the sale. This revenue has allowed me to improve the quality of my YouTube videos, cover website costs, and fund the development of the BBQ Journal. If you've benefited from any of the information I've created for you, this is a great way to help support Fattybombatty's Guide to BBQ. Thanks! I'm a huge believer in taking notes when you BBQ so you can learn from your mistakes, and repeat your victories. I didn't find anything that met my needs, so I put together Fattybombatty's BBQ Journal with fields that help you track the important details of BBQ. You wouldn't think that BBQ tongs are that different. You can find them nearly anywhere, and they all look similar. That's what I thought, too. As I was pulling a tri-tip out of the smoker one day, my tongs bent under the weight, and I almost lost the roast. That's when I realized that tongs do matter. I use these with confidence for everything. The shaft has steel folded around to give it the extra support you need when lifting larger cuts of meat. When someone gives me a different kind, I put them straight into the donation box. When working with high temperatures, protection is always a good decision. These gloves come highly recommended when pulling pork or brisket. In order to pull well, you need to take the cut of meat to 195º-210º. When you work with a piece of meat that hot, gloves become much more important. I went a long time before picking up an instant read thermometer. A big part of that was the price of the best unit around. Even though I BBQ frequently, I couldn't justify the cost. Eventually I stumbled across the Javelin PRO Backlit Thermometer by Lavatools. At around half the cost of the other (great) option, I went for it. It has worked wonderfully, and has a handful of great features (light up screen, hold "button" so you can read the temperature without putting your whole head into the smoker, and magnets that make it very easy to store). I picked up this knife recently as a cooking knife for camping. I decided to test it out while cooking for Thanksgiving, and was blown away at how nice it was to have a folding knife in my apron that I could use for anything. I've used it for a variety of things ranging from opening the ham wrapper to prepping the bird to smoke for thanksgiving. At under $20, this is a really nice addition to anyone's outdoor cooking setup. 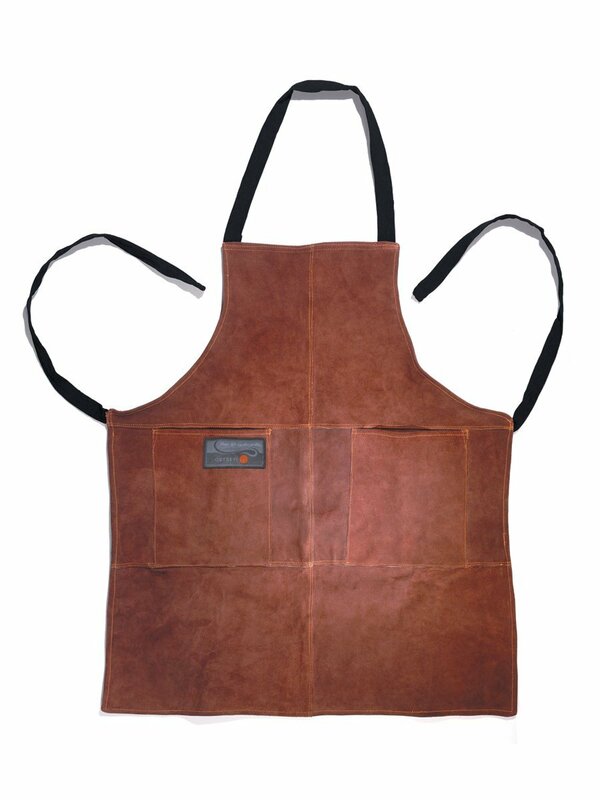 I had been eyeing this leather apron for a few years before receiving it as a gift. It is very durable, but not too heavy. It has nice large pockets that are very convenient. I've used them to hold my phone on one side and my knife on the other. It has withstood a lot of abuse, and does the job of protecting my clothes very well. It also adds a look of legitimacy to what you are doing. I've worn it for catering events, while moving equipment, and while smoking in the back yard. I was given shredding claws as a gift last year, and rolled my eyes. Before I put them in the donation pile, I decided to try them out. Life changing. While I don't have this specific pair, I'm recommending them over the pair I have because of the solid teeth. The pair I have does not have solid teeth, so they are a pain to clean. These are also BPA free, which is something I love to get when possible. They make the job of shredding large quantities of meat much, much faster. I've had this knife for five years, and have cut hundreds of pounds of meat with it. And it still cuts well. I'm continually blown away by how much easier this makes my job for both catering events, and serving dinner. it lands on the more expensive side of things on the list, but it is an extremely helpful tool to have in your BBQ toolbox. Have a question about a product I haven't covered? Let me know what you are looking for and I would be happy to make a recommendation.